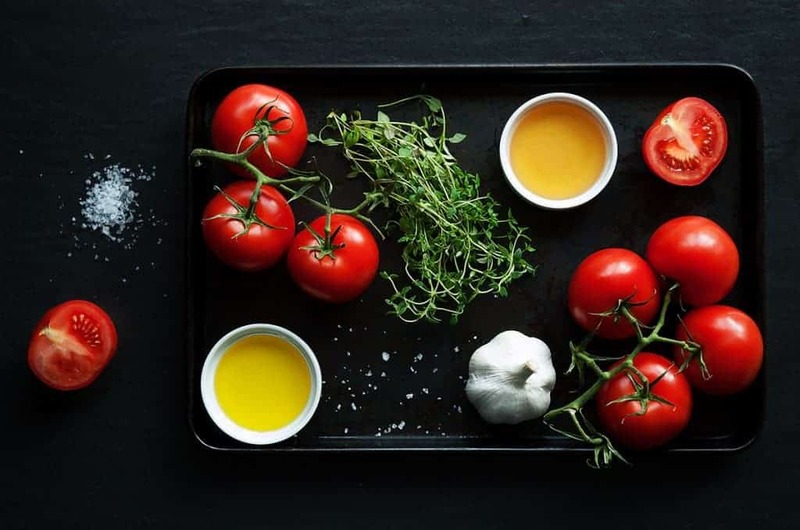 Lay tomatoes on a baking tray, skin side down and sprinkle with salt. Then drizzle the tomatoes with olive oil and honey. Place a few sprigs of fresh thyme on top of the tomatoes. Peel the outer most layers of the garlic bulb (no need to separate cloves) and place it whole in the middle of the tray. Add enough water so you have about 5-10 mm of liquid at the bottom of the roasting tray. This will stop all juices and honey getting burnt. You will use all of the lovely roasting juices later on when you blend the soup. 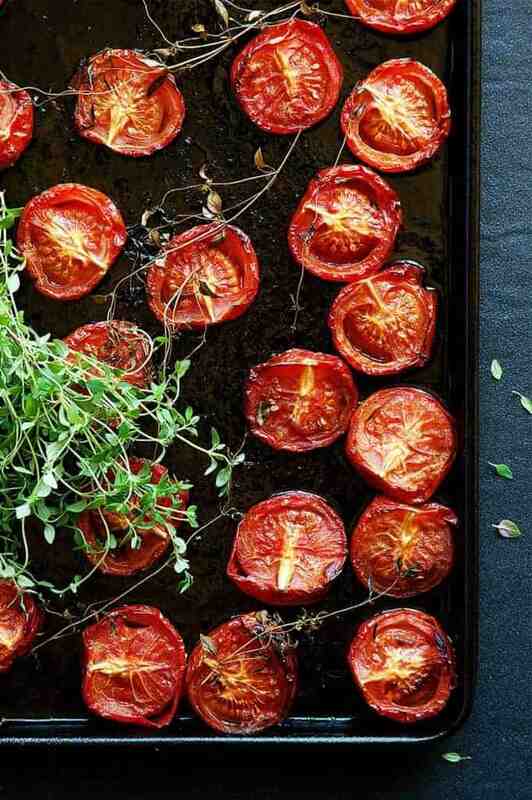 Roast the tomatoes for approximately 60 – 75 minutes. After 30 minutes take a peak to make sure that you still have enough liquid in the bottom of the roasting tray and take the garlic out of the oven. Add more water if required. Once roasted place all of the tomatoes, soft garlic centre of each clove (not the skin) and juices to the blender (if you are using a stand blender) or a bigger pot (if you have a hand blender). At this point, you can discard the sprigs of thyme as they have served their purpose. Roasted garlic will have a nice sweet taste. You can add as much or as little as you like according to your preference. Blend until nice and smooth, then continue blending on a slower speed while adding the vegetable stock. Add less if you want the soup to have a thicker consistency. Serve in a bowl decorated with Crème Fraiche and toast. During the summer months when the weather is warmer we prefer to eat lighter dishes. Our summer meals frequently include colourful vegetable soups packed with nutrients. I always associate summer with memories from my childhood. I remember many hours of swimming, walks in the forest and my granny’s amazing garden filled with fruit and vegetable. We didn’t have to go to the shops when we wanted to make a nice vegetable dish. Carrots, parsnips, courgettes, beans, potatoes, piece and much more – it was all there ready to pick. I can still remember the taste of homegrown tomatoes – so sweet and full of flavour. 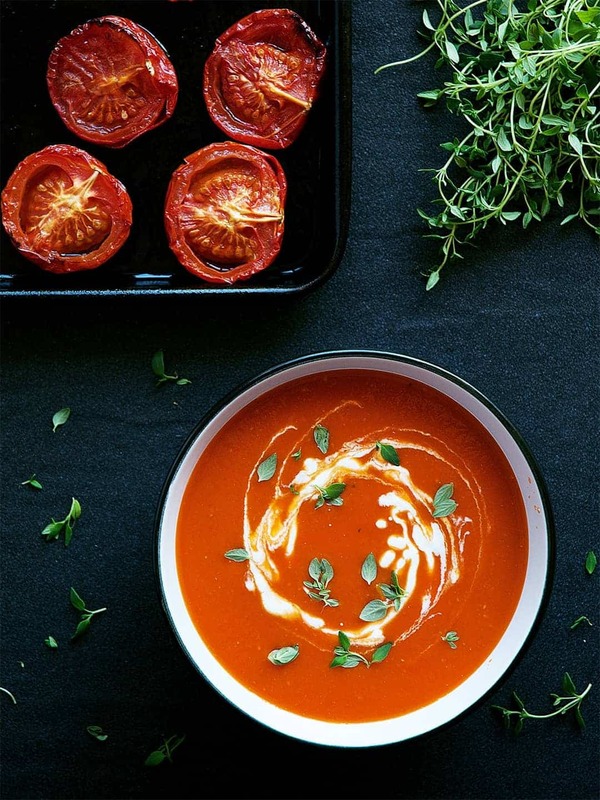 When my husband introduced me to this tasty tomato soup recipe I remembered my granny’s garden straight away. We enjoy this soup all year around but it’s always the best when the tomatoes are in season. Nothing can beat the taste and flavour of homegrown tomatoes freshly picked just before cooking. Either way, this tomato soup is delicious anytime and tastes great warm or cold.